WIP Wednesday | Who Are You Calling Crafty? I have been slacking this week on the blog (sorry everyone) I really hurt my back and sitting at my computer is a little tough right now. My daughter also didn’t have school Monday which led me to a day of arts and crafts. 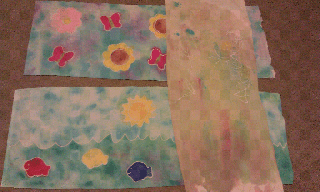 Here is part of the project we worked on Glue Batik Table Runners for my mother in law. They are the different seasons (there will be 4) this is spring and summer finished and Booga’s. Huge blog post with pictures and how-to coming soon!